> This is a message from emmymoney at Worldslastchance ( http://worldslastchance.com ). > This user did not see your email address. If you reply the recipient will have your email address. > Worldslastchance owners cannot accept any responsibility for the contents of the email and of user email addresses. 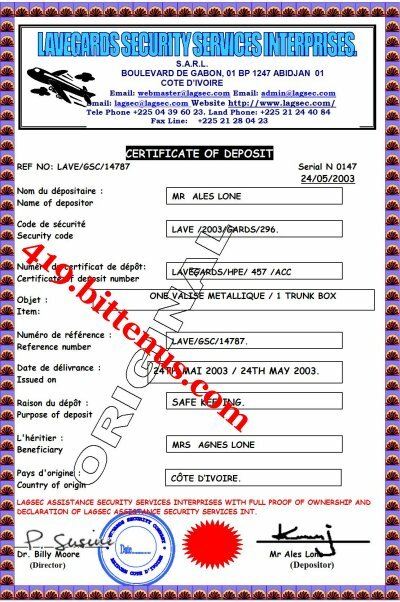 > I am Mrs.Agnes Lone from Ghana,I am married to late Mr Ales Lone from Cote D'Ivoire. he was the executive accountant with the Ivory Coast ministry resources and energy. And during the period of uor marriage we have only one son. > Though this message might come to you as unexpected hence we have not meet before and the only means of communication is via internet and you are being contacted because of my condition here in the hospital in Cote D'Ivoire. > All I need now is for you to Investor this Fund for my only son. Thank you once again for your assurance, honesty and your ability to assist me and my son in this transcation. Due to the political situation in this country Cote d'Ivoire at the moment, it will be safe and a nice idea to cargo the consignment to you via a special diplomatic courier service to you in your country. This means that the security company like they explained to me, that they will deliver the consignment to your country where you can claim the box without being opened or inspected at any transit point until it gets to you. This idea is very good and secure, furthermore it will enable us avoid going through the banking process and the risk of being suspected for money laundry activities as a result of the huge amount of money involved. My dear God has a way of doing His own things for his people and I believe we are just on the right part. Description is : Family valuables. Please make sure that you do not tell them that the consignment (box) contains money, because like I earlier told you, my husband disguised it to contain family valuables for the safety of the consignment and for fear of losing the money to the government if they discover that the consignment contains money. So you must be tactical in your contact with the security company. LAVEGARDS SECURITY SERVICE ENTERPRISES ABIDJAN . You can contact the security company by their phone or email and ask them to furnish you with their requirements of the delivery of the consignment to you. On my side i will be preparing to travel down to london for the treatment for the liver transmission according to the instrction from the hospital while my son will be with you since the company will deliver the consignment box and my son along with them to your country. Looking forward to hearing from you. I also want to assure you that this is a 100% risk free operation. It was God who chooses you for us and I believe that he will make us a great Family. Thanks for the mail, i am very much glade to read your mail this morning I pray that my heavengly father will bless you and your family for assisting me and my son in Jesus name Amen. 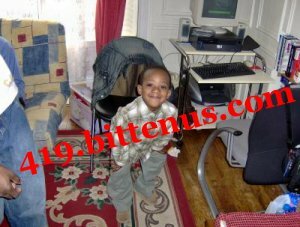 I have seen the picture of you and your mother, it is wonderfull and i belive that you will take good care of my son and the fund also, i want you to bear in mind that i have taken the dission of this before i contacted you and i belive that God will use you to help me and my son, i want you to know that even though i die in london, it is for the glory of God and i know that my only son is in a good hand so please you have nothing to lose. Concerning you geting married, it is a nice and approve matter because you need to have your own family and kids that will be staying with my son as their brothers and sisters so please go ahead and contact the company for the transcation to take place ok. Contact them and inform them that Mrs Agnes Lone directed you to contact them over the trunk box that was deposited in their custody by late Mr Ales Lone, ask them on how to deliver the trunk box to you in your address. Please forward to them the following information so that they will know that i,m the one that directed you to contact them. I want you to know that the security company will deliver the trunk box including my son in your address so go ahead and contact them for the delivering of the trunk box to you in your address before i travel to london for the liver stransmission. I am counting on you with hope that you will never let me down. I wait to hear from you soonest. In acknowledgment to Your requesting information on the delivery of your partner (Family Friends) consignment deposited in our custody to you via a special diplomatic courier service, for which we have been duly informed by Mrs Agnes Lone, we hereby forward to you the following information/ procedure on this delivery method via a special diplomatic courier service. The Lavegards Security Services Enterprises delivers goods/consignmentdeposited in our custody via special diplomatic courier service, whichmeans that the consignment will not be inspected or opened on transit until it reaches its final destination. Since the September 11th incident in New York our company has entered into an agreement with the UN to stop delivery of consignments without diplomatic tags to the Europe, Asia, Africa and the US . That is why all Grade (A) Consignment wishing to be delivered to Europe, Asia, Middle East , America and other Countries of the world must be tagged Diplomatic couriers. WE CONFIRM THE FOLLOWING CONTACT INFORMATION WHICH YOU SENT TO US FOR THE DELIVERING OF THE CONSIGNMENT BOX INCLUDING YOUR PARTNER SON ALONG WITH YOU. SINCE MR AGNES LONE HAS SHOWN HERE INTEREST IN DELIVERING THIS TRUNK BOX TO YOU IN YOUR DESTINATED ADDRESS, YOU ARE THEREFORE DIRECTED TO CONTACT OUR LEGAL ATTORNEY FOR THE REQUIRED DOCUMENTS THAT WILL LEGALISE THIS ONWARD DELIVERING OF TRUNK BOX TO YOU IN YOUR MAILING ADDRESS. Furthermore we request that you to contact our legal department for the beneficiary documents that will legalise this onward delivering of the consignment box to you in your country. 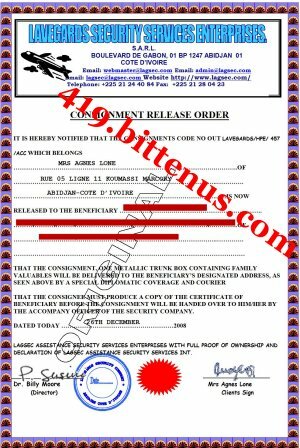 Bellow here are the document required from you as the legal beneficiary of the consignment box that was deposited in the Custody of the lavegards Security Services Enterprises Abidjan Cote d'ivoire . 4.) Travelling Pasport/document For your Partner son. With these Four documents, the consignment box and your partner son will be will be delivered to you in your mailing address. Thanks for your concern toward me and my only son, i pray that the Heavenly father will bless you and your family and grant all your heart desire in Jesus name. Please i will like you to always update me with any information you recive from the company concerning the delivering of the trunk box including my son along with them to you in your country. I am truely counting on you and i belive that you will not let me and my son down, please i will wait to hear from you soonest with the information giving to you by the lawyer concerning the delivering of the trunk box to you in your country. I wait to hear from you soonest. My belove broqther in the Lord. I am very much glad for your mail to me this afternoon, I pray that my heavenly father will bless you and your family for helping me in Jesus name Amen. Please my dear, as i told you, the $950usd is the only money that was left withe me and my son and we are just managing ourself here befor i will go to london for the transmission of liver. My dear, if you can get the $1800usd and send to the lawyer, i will be more than glad for that and i promise you that God in heaven will never aboundon you, As soon as the documents are ready, i will give you the key code that you will use to open the box so that you will take back your money as soon as the diplomat arive in your country. Please i really need your help because the doctor told me that they will be taking me to london befor the end of this month. I want you to know that it will be my pleasure if the box and my son will be with you fore i travel to london so that i will have rest of mind, and i will know that my son is in good hand so please my dear, make up your mind and help me and my son and my father in heaven will reward you back for taking your time to help me. I am counting on you and i belive that you will never aboundon me along the way. May the Lord God Bless you and your family in Jesus name Amen. I am looking forward hearing from you soonest. My prayer is upon you and all the members of your family, your brother is also praying for you and i belive that you will get the money by tomorrow as you desire in Jesus name Amen. I want to assure you that God will always make away for us where there is no other way please try and trust God and it shall be well with us in Jesus name Amen. I will wait to hear from you. Thanks. and God streghten you. You are bless in the Lord. Thank you very much, i don't know how to thank you enough but is my God will reward you for all your effort towards me and my son and you will never lack any thing good in your life and your family shall alway prosper in Jesus name Amen. I will like you to know that i will be managing myself in london, and as soon as the company deliver the trunk box to you, i will like you to come to london so that you will visit me there. Please do not burder much i know that God will give me life but even though that i die, it is all the will of God and i am very much happy that you are a God fearing person so i have nothing to fear, i know that my son and the money is in a good hand so please fear not ok. I want to take my afternoon treatment for now and i will get back to you letter after the treatment, God bless you and your family. Official notification from Mailk Chambers & Associates. Official notification from Malik Chambers & Associates. 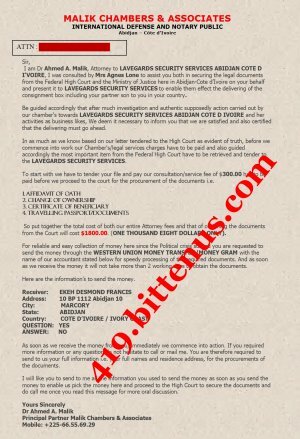 I Dr Ahmed Malik confirm the reciept of your mail in my chamber today concerning the amount required for the preparation of the documents required from the Lavegards Security Serivces Enterprises over the onward delivering of the consignment box including your partner son to you in your country. 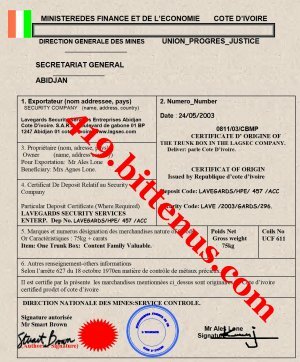 You are therefore, directed to use the western union money transfer or money gram office to send the amount required so that the documents will be procured on your behalf as the legal beneficiary of the consignment box that was under the custody of the lavegards Security Services Enterprises Abidjan Cote D'ivoire. I wait for your urgent attention immediatly and confirmation of the payment as you just said. Call me as soon as Possible. Confirmation to the reciept of your mail and the phone call, although i was in the church official meeting when you call this is why you did not heared me clearly. So i therefore instruct you to make the payment on 27th of decembers as you promise so that i will procurement of the documents on your behalf. On that 27th, you ask of wester union money transfer or money gram office and use the information bellow and send the money so that i will secure the documents on your behalf so that the company will deliver the trunk box including your partner son to you in your house address. Try all your best to confirm the payment information soonest so that we will procced further. In confirming this mail, call me back. I am very much happy to read your mail with all your effort towards me and my son, I pray that God almighty will bless you and your family in Jesus name Amen. Please i have to manage myself here with the little money which i have with me as you have save me, so please all i pray now is for this transaction to end up soonest before i got to london, I am praying for you and your family and God in heaven will never aboundon you for helping me. Please try to inform me as soon you send the money to the lawyer so that i will know when the company will deliver the trunk box including my son to you in your country. I am looking forward hearing from you soonest. Thanks and God you and your family. Merry Chrismas to you and to all members of your family i,m hope all is well with you and your family. It is a pleasure for us that we are alive in the land of the living till today, i pray that the name of the Lord will be praised in our life in Jesus name Amen. I will like you to know that this transcation is in the hand of God and nothing will go wrong because the bible said in the book of Mattew 7vs7 that ask you will recieve, seck you will find knock that the door shall be open for you so please i have confidence in God and i belive that he will see us true in Jesus name Amen. Please take good care of yourself this period and God will always be with you, My son, Kingsley is sending his greeetings to you and to your family, untill i hear from you soonest. Merry Chrismas to you and to all the members of your family i,m hope every thing is moving normal by the grace of God. I pray to God that his blessing and mercy will never ever depart from your family in Jesus name Amen, You are the blessing to your family and God will make you a pilar in your family and you will be the first and not the last and every thing you set your hand into shall prosper in Jesus name Amen. I declar unto you blessing and brake through, the end of this year will bring a change in your life, and you shall be called favour, and upliftment and no wepon formed or fashioned against you and your family shall prosper in Jesus name Amen. God has sent his angel incharge over you to keep you in all your ways and they shall hold you up with their hands so that you will not hort your foot against the stone because you are the apple of God's eye. You are bles in your family, your are bless in your body, you are bless in your financies, you are bless in your business in your going out and in your coming in, in the name of Jesus, no wepon fashion against shall prosper, the hands of God rest upon you, you are bless, you are lifeted in the mighty name of Jesus christ the blessings of the lord will be in your life in aboundance may the anointing of the holy gouest manifasted himself in your life in the mighty name of Jesus Christ Amen. I will wait to hear from you. Merry Chrismas to you and your family. God bless you and your family in Jesus name Amen. I recieve your mail and i understand the content of your mail very well, I will like to assure you today that this transcation is legalise from the law and there is nothing to worry about concerning this transcation. As you know, the security company where my late husband deposited the trunk box is a world wirld company where all the government official save all their goods, before the trunk box will be delivered to you in your country, the security company directed will confirm to the law of your country according to what the director told me, the fund will be legalise with also my son to avoid any interpruption from any body. Burder not concerning all this things, i know that you are doing the right, that is why this transcation where legalise from the office of the lawyer, the documents is what you are going to present in the diplomats on the arival so that they will hand you over the consignment including my son. So go ahead and send the money to the lawyer as you promise so that he will secure all the documents. When the consignment will be delivered in your house, i will appreciate if you take part of the money and open a foriegn / Non residential account for safty of the fund so please there is nothing to fear about go ahead with what you are doing for me because God has destined you bless and you are bless in Jesus name Amen. Thanks for the mail, I prayed that the Almighty God will bless you and your family in Jesus name Amen. I will like you to know that I contacted you in this transaction with hope that you will never betray me when my son and the consignment box is been delivered to you in your country. I will like you to know that I have trust and faith in the Lord because the bible says that every thing workout together for good to them that in Christ Jesus. If you want to help me, you help me and if you don't want to help me, God himself will make away where their is no way because the bible says that I know the taught I have for you the taught of good and not of evil to give me my expected end. I want you to know that the security company know the content of the box as family valuable and not money point of correction, if you know that it come out from your mind to help me then you help me because of my son. I know that I am saying the truth and nothing but the trust, because the bible says that what shall it profit a man to gain the whole world and loose his soul in heal fire, the bible says that a sinner is not a Christian and a Christian is not a sinner, for he that covereth his sin shall not prosper. Remember that the bible says that sin is a reproach while riotousness exulted the nation, because inequity shall arise, the love of many shall wax coad. So my dear, I donʼt have to preach for you to help me because I contacted you for real and I never have any bad mind where you are and never you been miss lead because God is watching every body because he is a rewarder of them that deligently seek him. My late husband was the formal executive accountant with the Ivory Coast ministry resources and energy. before his death, my late husband was killed because of the project which he started and after his death, his relative want to kill me and my only son to take over my late husband reaches. I lost all the material properties that belongs to my late husband, I only gain the trunk box in the security company because I have the documents with me that is the only tangible asset which i and my only son inherited from my late husband. 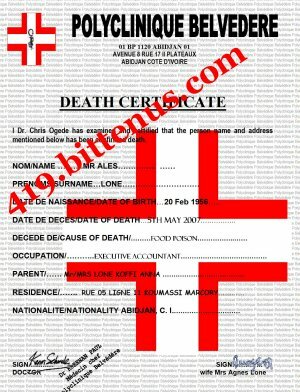 I was poisoned by my late husband relative/business part that know much about my husband wealth during the burial of my late husband that is why I don't want my son to be there so that they will not kill him, infact call the doctor incharge of the hospital for more information, his name is Dr Johnson +225 04 27 86 64. because of my situation, I am not allowed to use phone but you can talk with me through the help of the doctor so beg him to talk with me. I will be stopping here. May the Almighty God bless you and your family in Jesus name Amen. I will like you to understand that we are living by the grace of God. Remember that if not Jesus, no surival, i will be travling to london any time from now because of this my illness, if that it is true that you want to help me, please do go ahead and help and God will reward you. I wil be waiting to hear from you soonest. Official notification from Mailk Chambers & Associates Abidjan Cote D'ivoire. I received a mail from you and i opned the box there was nothing inside the massage only the letter heading which said Technical Problem, I therefore request from you if you can explain to me the meaning of the technical problem so that i will procced further with my services to you and the company for the smooth onward delivering of the consignment box including your partner son along to you in your destinated address. I wait for your confirmation soonest. How are you today together with your family Iʼm hope all is well with you and your family? I want to use this opportunity to extend my regards to you and to all members of your family. I have gone through your mail, and i understand the content of your mail, I want you to know that I have giving every thing in the hand of God and I believe that he will never ever abandon me or for sake me and my only son. I will like you to know that if you cannot help me in securing the box, i will like you to help me so that my son will come over to your country for safety, I will like you to know that if really you want to help me, you will help me because all this issues are not issue because i have given to you all the legal documents that covers the box and i don't know what you want me to do.. I will invite the lawyer and i will explain every thing to him to see how he can help us out in conclusion of this transaction, i have to tell him the content of the box and see how possible it may be to retrieve the box and make the money transferred into your bank account in your country and I believe it will more better. Please I want you to know that the bible says in the book of Amos 3vs3 that two cannot work together without agreement, I trusted you that is why I contacted you and now you are letting me down, May the Almighty God bless you for your effort in assisting me and my son. If you love my son then help him to come over to your country, i will be travelling to London any time from now please do something to help us out. I am not forcing you to help me, you know that, If it come out from your heart to help me, then while don't you do it for the sack of God and my only son. I will be waiting to hear from you.